Yesterday we were taking a leisurely stroll around the neighborhood with Pippi when we chanced upon the Cafe Wamp tucked inside a bunker-like space beneath the overhead expressway. Capitalizing on any usable space (defined broadly), the gaps under elevated transit lines of all sorts often house a variety of commercial endeavors like shoe repair shops, dry cleaners and sketchy bars only open after sundown. Because of its menu posted outside and friendly-seeming folk seated at street-side tables, I took a closer look. Much to my surprise, the small shop not only carried dog paraphernalia alongside tea and cakes, it had actual dogs. And lots of them. Curious, I approached the proprietor, an amiable chap who spoke rather good English since he used to play football in Florida. 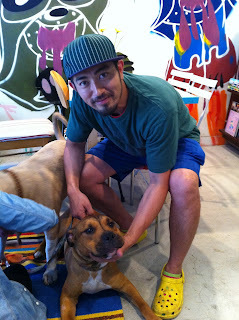 A dog lover, he rescues dogs and keeps them at his shop until he can find homes for them. At the moment he is maxed out with motley collection of mostly pit bulls and a few mixed breeds, all big dogs. The animals looked a little bored but well tended. Clearly they get a lot of attention from the Wamp staff and customers. 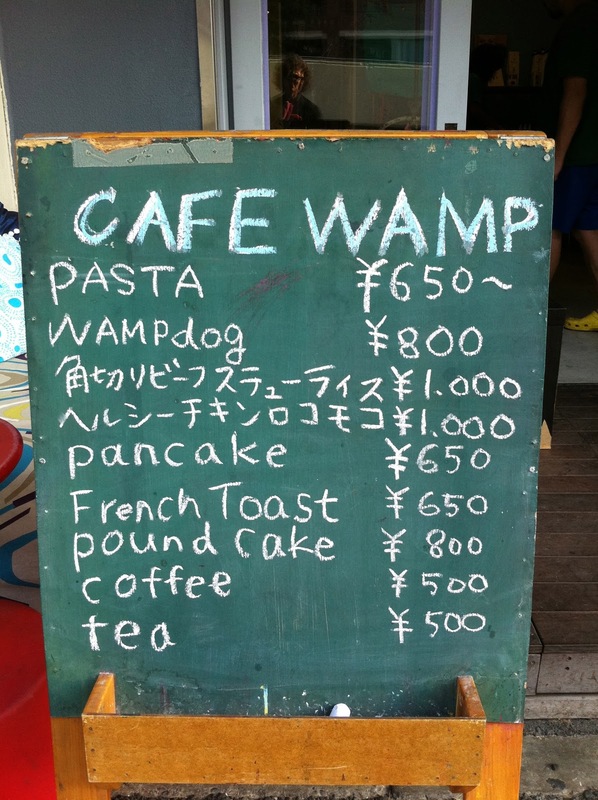 Wondering about the name "Wamp," I probed the proprietor. Combining English and Japanese, this made-up word is based on a slang Japanese expression, "ippuku," meaning "one puff." Though a reference to taking a puff on a cigarette (ichi + puku), the term has come to mean "taking a short break." And translating "ichi" into "one" led the cafe owner to the sound written "wa" which is also a play on the Japanese word meaning "harmony." 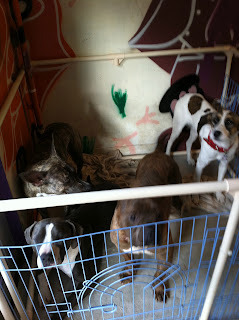 Anyhow, if you know of anyone looking to adopt a dog, please drop by Wamp. The cafe is on Meiji Dori, between Tengenjibashi and Furukawabashi. 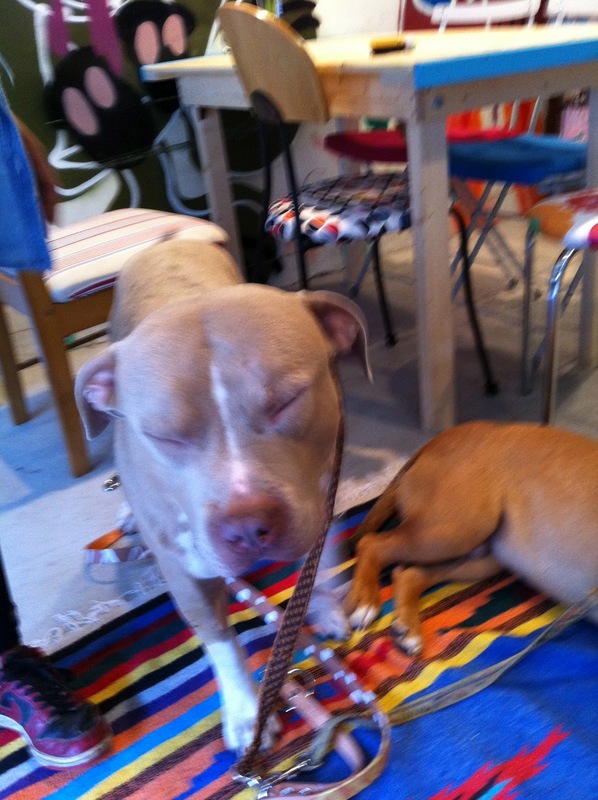 If it weren't for the cafe, these dogs probably would not have a chance since there is no such thing as a no-kill shelter in Japan. Their plight seems particularly heartbreaking in a country where people lavish unbelievable expense and attention on their pets yet look the other way while hundreds of dogs are "euthanized" weekly. I harbored some concern about the proprietor and what he is up to ... what is your impression?